Sunday 17 february 2019 – Another finish in style. 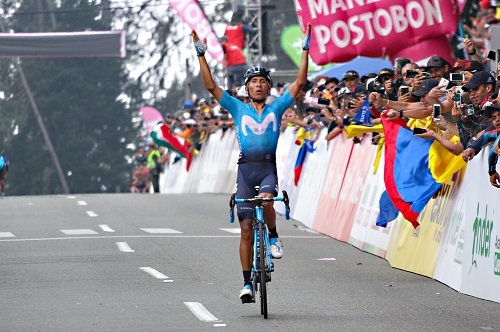 Just as it happened at the final day of the 2018 Tour Colombia in Manizales, a Movistar Team rider crossed the finish line raising his arms victorious at the end of a big mountain. 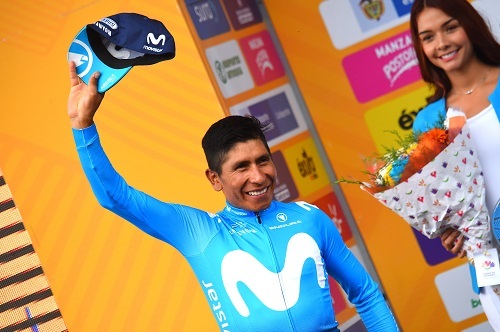 Nairo Quintana conquered yet another prestigious climb, seven months after his victory atop the Col du Portet in the Tour de France, and took the honours in the Alto de las Palmas, end of the Queen stage in the Latin American event -173km starting from El Retiro-. Quintana launched up to four attacks inside the last 7km of the climb, the first of which helped him reach team-mate Winner Anacona, who had set up the perfect scenario for him to move with a previous acceleration 10km before the end. 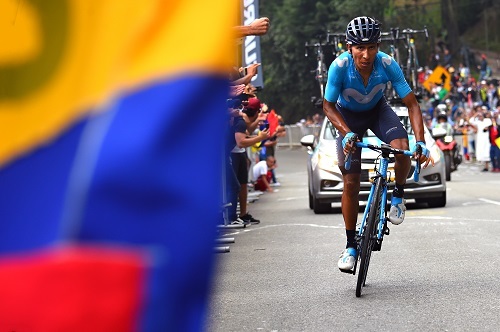 The final selection, with Nairo alongside Egan Bernal, Iván Sosa (SKY) and Miguel Ángel López (AST), was nearly ruined with 3km to go as a spectator running alongside the riders fell down just before Sosa and Quintana, who had to put a foot to the ground as López flew past. Despite Sosa and López leaving Nairo behind with 2km remaining, the lack of cooperation between them helped the 'Cóndor of Boyacá' bridge back again and launch a final acceleration to notch up his 40th UCI win, the 37th since he landed in the WorldTour with the Movistar Team in 2012 and his first in Colombia as a pro. At the overall classification -conquered by López-, Nairo finishes in 5th place as Richard Carapaz, a big protagonist at Saturday's spectacular La Unión circuit, concluded in a fine 9th spot. Nairo Quintana: "It's always been hard to win in Colombia when we had a chance to race here. The two editions of this Tour Colombia have been of a very high competitive standard, and these previous stages were fierce, of brutal competitiveness. However, the love and passion of the fans and all the cheer I had from them all day gave me that final bit of energy I needed to launch the final attack and take the victory. The incident with the spectator? It's an analogy of life. It happens sometimes - you stumble, you fall down, you've got to get back on your feet, rise again and keep fighting to win. That's what we did today. It's a victory full of emotions, a day of big happiness, a day when we really worked hard together with the rest of the team, who kept me calm for the entire race. It's also a celebration I want to share with all Colombians, all Latin people, those who came over from abroad to meet this region, and especially those from here - stay happy, continue to enjoy cycling. Hopefully events like these can live on and prosper!"